The Florence Freedom, presented by Titan Mechanical Solutions, held on to defeat the Normal CornBelters 4-3 and extend their winning streak to seven. Florence's Braulio Torres-Perez was masterful in his first eight innings, keeping the CornBelters (44-50) scoreless. He also benefited from some fine defensive work to escape a couple of tough jams. In the third, Normal threatened with runners on the corners and nobody out. After a shallow flyout to center, Aaron Dudley hit a smash that Jordan Brower stabbed on a bounce. He stepped on the bag and fired home to force the runner into a rundown, which ended up ending the inning. The CornBelters put two men in scoring position in the fifth with one out and a couple of really good defensive plays helped Torres-Perez escape. Daniel Fraga picked up a chopper on a backhand and fired home to cut down a potential run at the plate. Then Andre Mercurio dove to catch a sinking line drive in center. The Freedom took the lead in the sixth. Taylor Oldham and Andrew Godbold led off the inning with singles, putting runners on the corners with nobody out. Austin Newell hit a one-hopper to shortstop and the Normal defense was able to throw out Oldham at the plate. But, after a steal, Collins Cuthrell sent a chopper to center that scored two and put the Freedom ahead 2-0. After a great sliding catch from Godbold helped Torres-Perez to a 1-2-3 sixth, Florence added two more in the seventh. Oldham launched a two-run homer to left field, extending the lead to 4-0. Mercurio's diving catch in the fifth propelled Torres-Perez to his best stretch of the game, sitting down 10 in a row and bringing a shutout into the ninth. 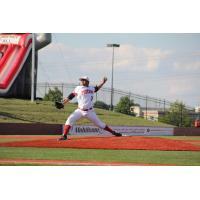 The CornBelters rallied in the ninth to make it interesting. Four consecutive hits scored two runs and put the tying run on first. Pete Levitt came into the game and the Freedom nearly turned a 6-4-3 double play, but the runner was called safe at first and a run scored, cutting the lead to 4-3. The next batter hit a shot to Oldham at third and he fired across the diamond to double off the runner and end the ballgame. Torres-Perez allowed three runs in eight-plus innings on 10 hits, while striking out two. Levitt earned his first save of the season. Oldham had two hits, including his 14th homer of the season, while Cuthrell also drove in a pair and Fraga added two knocks and a run scored. Chris Carmain tossed 153 pitches in taking a complete game loss, allowing four runs on eight hits. The Freedom round out their 2016 schedule with a 4:35 p.m. first pitch against the CornBelters tomorrow. Florence's Jordan Kraus (7-8, 3.18 ERA) will face off against Max Homick (4-6, 3.81 ERA).